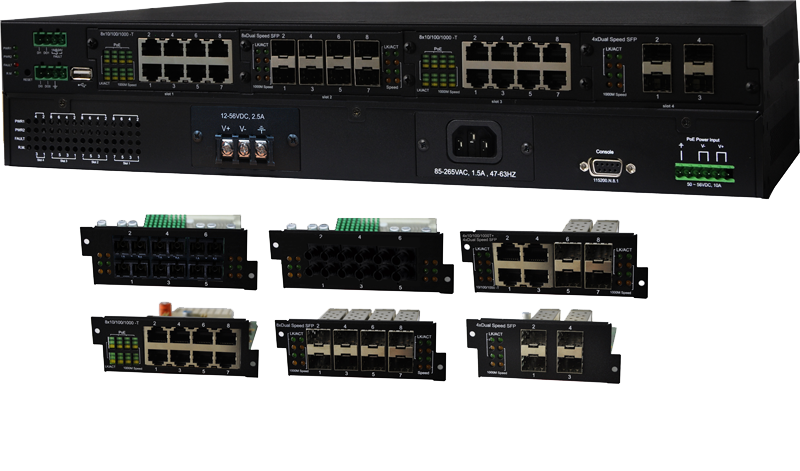 Lantech IPGS-5400-2P is a high performance L2 + managed industrial switch which provides L2 wire speed and advanced security function for network aggregation and backbone deployment. It delivers ITU G.8032 enhanced ring recovery less than 20ms including dynamic coupling ring, and enhanced mode for easy configuration, comprehensive QoS, QoS by VLAN, advanced security including INGRESS/EGRESS ACL L2/L3, SSH/SSL, Mac based DHCP server, DHCP Option 82, DHCP server, IGMPv1/v2/v3/router port, QinQ* (double tag VLAN) which are important features required in train and large network. It also supports Cisco Discovery Protocol (CDP) and LLDP for Ciscoworks to detect the switch info and show on L2 map topology. The highly flexible modular design consisting of maximum 24x Gigabit T+4xDual SFP,24x Giga PoE at/af +4xDual SFP, 28xGigabit/100M SFP, 18x100M ST/SC + 4 Gigabit SFP covers the widest deployment of applications. Lantech IPGS-5400-2P features enhanced G.8032 ring which can be self-healed in less than 20ms for single ring topology protection covering Multicast packets. It also supports various ring topologies that covers double ring, multi-chain (under enhanced ring), train ring, basic ring by easy setup than others. The innovative auto-Ring configurator (auto mode) can calculate owner and neighbor in one step. It supports MSTP that allows RSTP over Vlan for redundant links with 8/16* MSTI. The IPGS-5400-2P also embedded several features for stronger and reliable network protection in an easy and intuitive way. When the pre-set ring configuration failed or looped by miss-wiring, Lantech IPGS-5400-2P is able to alert with the LED indicator and send out an email, traps or a SMS text. Repowered auto ring restore function(Node failure protection) ensures the switches in a ring to survive after power breakout is back. The status can be shown in NMS when each switch is back. This feature prevents the broken ring and keep ring alive without any re-configuration needed. Loop protection is also available to prevent the generation of broadcast storm when a dumb switch is inserted in a closed loop connection. The user friendly UI, innovative auto topology drawing and topology demo makes IPGS-5400-2P much easier to get hands-on. 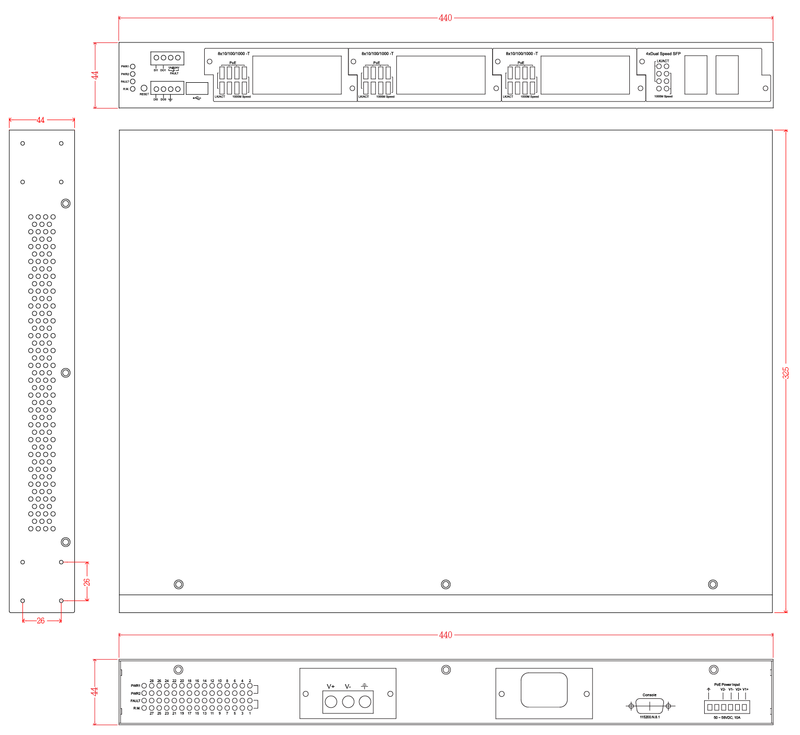 The IPGS-5400-2P supports DMI interface that can correspond with DDM SFPs (Digital diagnostic monitor) to display the five parameters in Lantech’s UI, including optical output power, input power, temperature, laser bias current and transceiver supply voltage***. The TX power/RX power raw data is automatically converted to dB values for installer, making it easier to calculate the fiber distance. Complete CLI support allows professional setting. Lantech IPGS-5400-2P configuration file can also be exported in text file so that it can be edited and configured back to switch with ease for mass deployment. The factory reset button can restore the setting back to factory default and built-in watchdog design can automatically reboot the switch when cpu is found dead. The USB slot allows user to backup/ restore configuration. QoS by VLAN can allow switch to tag QoS by VLAN regardless the devices acknowledge QoS or not in which greatly enhance the bandwidth management in a network. The environmental monitoring can detect switch temperature, voltage and current where can send the SNMP traps, email and SMS alert when abnormal. The PoE modules support advanced PoE management including PoE detection and scheduling. PoE detection can detect if the connected PD hangs then restart the PD; PoE scheduling is to allow pre-set power feeding schedule upon routine time table. 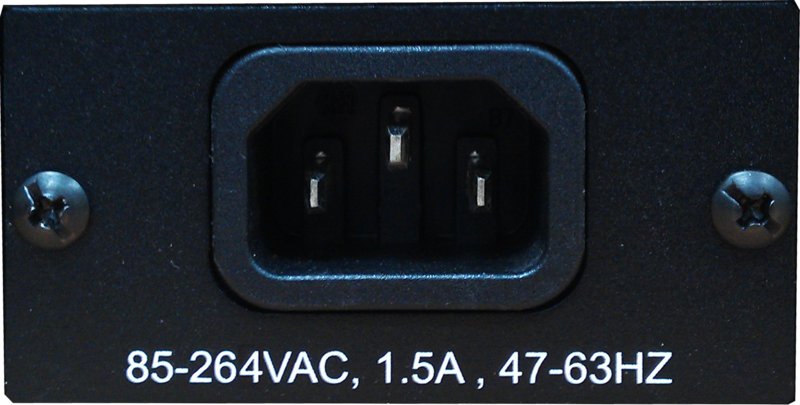 It also supports per-port PoE status including current, voltage, watt and temperature information. The IPGS-5400-2P DIDO function can support additional open/close physical contact for designate applications besides Port / Power events, for example, DIDO function can trigger alarm if the switch was moved or stolen. In case of events, the IPGS-5400-2P will immediately send an email to pre-defined addresses as well as SNMP Traps out. 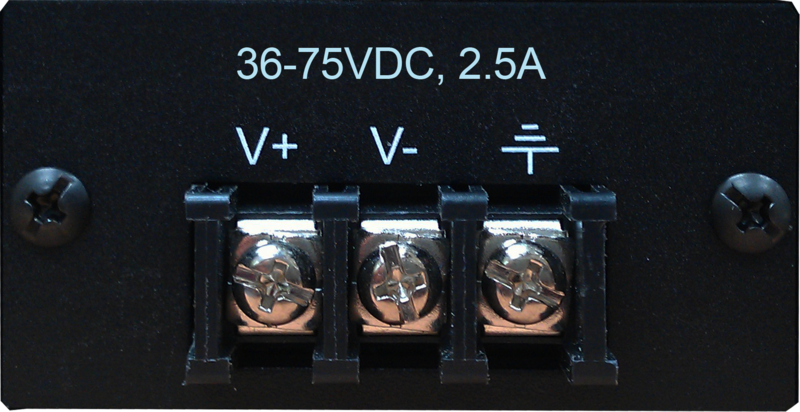 It provides 2DO while disconnections of the specific port was detected and relay contact will activate the alarm. 2 DI can integrate the sensors into the auto alarm system and transfer the alarm information to IP network with email, SMS and SNMP. Lantech IPGS-5400-2P chassis and modules are designed for easy maintenance and installation; It also supports dual power supplies (DC12~48V/ isolated 36~75VDC) and (isolated 85~265VAC/100~370VDC) to increase the network reliability. 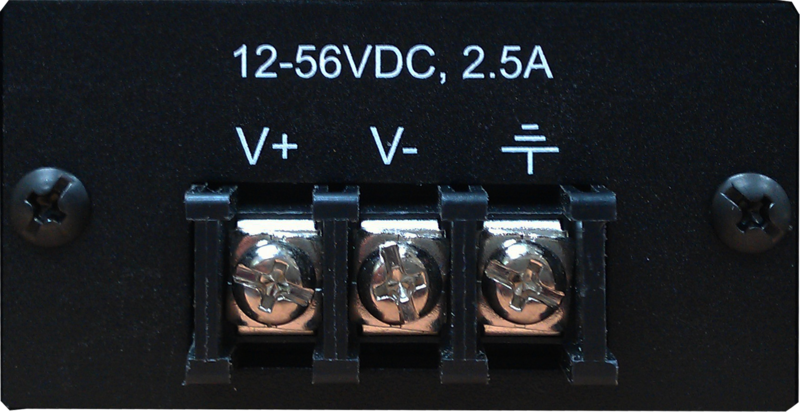 It also supports terminal block for connecting DC 48V PoE power source. Lantech IPGS-5400-2P features high reliability and robustness withstanding extensive EMI/RFI phenomenon, inductive load switching, high ESD (±8000V ESD/ ±4000V EFT), high fault current environment usually found in Steel automation, Mining and Process control etc. 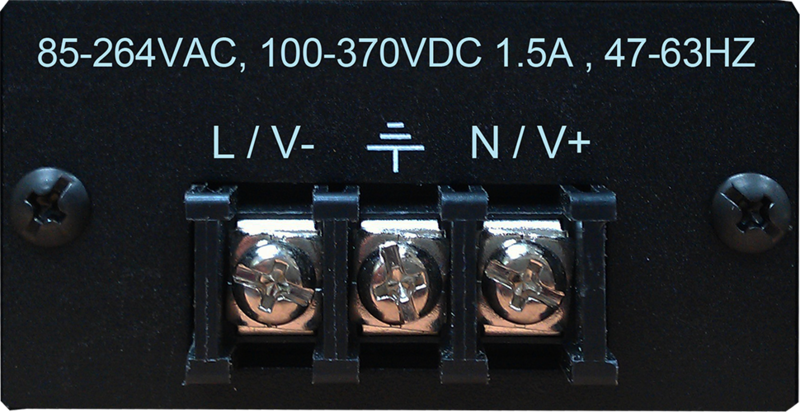 IGS-5400-2P can run under widely operational temperature ranging from -40°C~75°C (-E); in the harsh and critical environment. Support ingress packet filter and egress packet limit. The egress rate control supports all of packet type, the limit rates are 0~100Mbps. Note: the modules will be factory pre-installed.